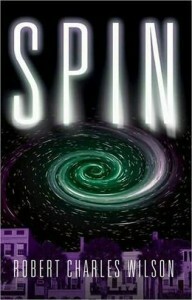 Syfy, along with Universal Cable Productions, is adapting Robert Charles Wilson’s popular science fiction novel, Spin, for television. This adaptation, penned by Fight Club writer Jim Uhls, will be televised as a six-hour miniseries. Spin won Wilson a Hugo Award for ‘Best Novel’ in 2006, and remains one of my favourite big-idea science fiction novels of all time, and is a perfect candidate for a mini-series adaptation. Part coming-of-age story, part political thriller, and part first contact story, Spin focuses on Tyler Dupree and his childhood friends, Diane and Jason Lawton, following them from the innocence of adolescence to their roles as adults caught up in an end-of-the-world crisis. Meanwhile, Earth is enveloped by an opaque bubble that slows down time on earth to the point that every passing second on the inside is equivalent to 3.7 years on the outside. As years whiz by outside, the citizens or Earth are threatened by the quickly approaching heat death of the sun, and a visit from a mysterious visitor from Mars. It’s a heady concept, but Wilson executes it brilliantly, and there is more than enough content in the story to create a tense and compelling mini-series. Spin, along with Childhood’s End and Krypton is the latest in a series of efforts by Syfy to reinvigorate its network with original, science fiction-based programming. If they’re trying to catch the interest of core science fiction fans, they could do much worse than adapting Wilson’s work. There is no announced air date for the Spin miniseries. I loved SPIN (wasn’t so thrilled with the sequels though). Spin is one of my favorite science fiction novels. It’s almost too bad RCW wrote the sequels because they are nowhere as compelling as the first which is full of really interesting ideas. I think Spin will work GREAT as a stand-alone miniseries. SyFy is really cooking now with this news and the fact that James SA Corey’s The Expanse television series adaptation is coming out later tis year, huh?